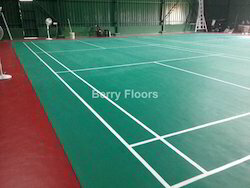 Service Provider of a wide range of services which include badminton court flooring, badminton flooring, badminton flooring for badminton courts and sports flooring. We are among the leading names in the industry that are engaged in offering Synthetic Sports flooring for Indoor stadiums and Courts. The shades available are Green, Blue, Orange and Wood finish. It absorbs shocks and gives soft feeling to the foot. These floors can be easily cleaned. 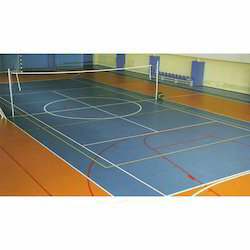 We offer our esteemed customers Badminton Flooring at market leading prices. These have been manufactured using cutting edge technology and premium grade materials. A variety of surfaces suitable for indoor facilities characterized by a heterogeneous, non determinable multi layer structure for high shock absorption, energy return and playability. 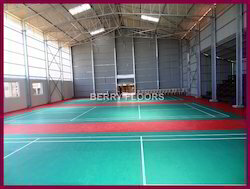 We are offering wide range of Badminton Flooring for Badminton Courts. We are among the prominent traders and suppliers of Sports Flooring. We provide these products under the brand name Unitex. This is latest variety in Sports flooring.